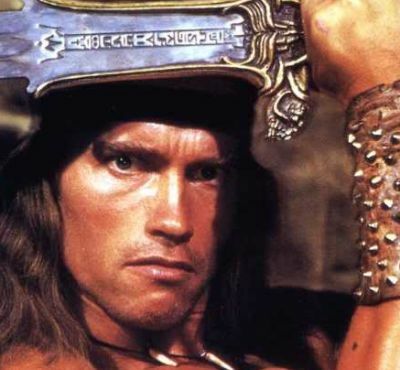 One project we continue to hear rumblings about online is The Legend of Conan, a direct sequel to 1984’s Conan the Barbarian with Arnold Schwarzenegger once again playing the character, though in the twilight of his years. Last we heard, writer Andrea Berloff had been hired to pen the script for the film, but now, in an interview with The Arnold Fans, producer Fredrik Malmberg says a script polish will be delivered shortly and they’re hoping to start production in Spring 2015. Malmberg went on to say that though they hadn’t chosen a director for the project just yet, a number of candidates have come forward expressing interest, ranging from “old great names” to “new fresh faces,” as he puts it. He also revealed that they would like for The Legend of Conan to be Schwarzenegger’s next film following the upcoming Terminator reboot. Universal Pictures were previously aiming for a 2014 release for the film, though we would expect the film to land in theaters in 2016 at the earliest.